Rest In Peace, my Friend…. Yesterday when I wrote the entry about the Batesville Casket Company and that somewhere, someone would be sitting and making a decision on such things, I had no idea it would be for one of my dearest friends, Barb Inch. Barb was just in her late 40’s in November 2010 she felt a lump in her breast. She had just run the Marine Corps Marathon here in DC. She’s that kind of person…she can do anything. She thought maybe it was nothing to worry about but she and Mark decided to ‘get it checked’ and it was cancer…very serious, aggressive cancer! That began her 15 month journey with cancer. They were living here at the time and as I said are like family. Mark has been in our families lives for over 30 years. He had just finished his freshman year in college when he came to Panama to work with me as a Youth intern at our Army Chapel. Our kids call him Uncle Mark. Barry even commissioned him as a 2LT. When he and Barb married we all were moving around the Army, so we didn’t meet her until they were at West Point and we were at Carlisle in the early 90’s but we knew we would be great friends. They eventually got stationed in DC around 2002 I think and by then had 4 kids. All 6 of them camped out at our townhouse for about a month and then moved in around the corner! We played endless games of Phase Ten, made tons of pots of chili and laughed so hard our stomachs ached. We WERE family. Eventually they returned to DC..first Mark then Barb the fall of 2010. Mark had been deployed a LOT and for LONG stretches, so now they were together. The cancer came as they were still unpacking boxes in their rental house. I watched Barb and Mark as they fought this curse! I watched how she faced it with honestly and integrity. We had long talks and cried many tears…but we also laughed as she donned a pink wig and was determined to LIVE..and LIVE she did! She became an advocate for being positive, being prayerful and staying active. She didn’t let the cancer control her. She LIVED. 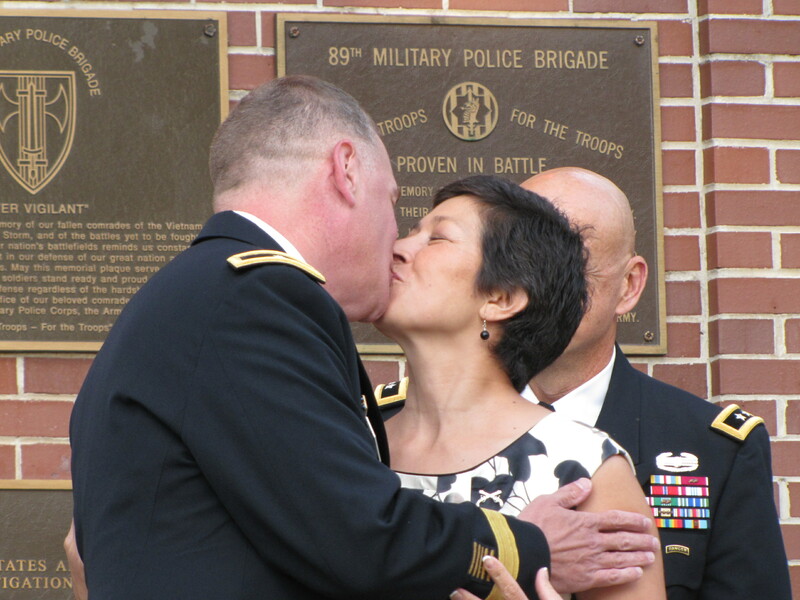 Mark was promoted to Brigadier General and that meant a move.. right in the middle of her treatment..but SHE LIVED. She packed up and moved to Fort Leonard Wood. We flew out for Mark’s promotion and spend three great days laughing, and LIVING. They were waiting on a trial to open up for her to be part of…..
Last night, Feb 1st, we found out she had passed. She was put in the hospital for pneumonia…likely the cancer had gone from the breast to the lungs..and she could no longer fight it. As I LOOK BACK I am so blessed to have memories and many many pictures of Barb as a friend, a wife and a mother. I treasure those visual memories of her and they bring me much comfort today. As I LOOK FORWARD I know that the pain and tears of today will be replaced by the pure JOY of knowing Barb. For today I reflect on what I can learn ….and putting it in writing helps…. I can REJOICE that even when I do NOT understand why God doesn’t always intervene and cure disease when we bombard heaven with our prayers, that I can BELIEVE..He is GOD and we are NOT and I BELIEVE that Barb is in Heaven and has peace now, and I BELIEVE that I will see her again. I am determined to live my life in a way that also brings JOY like Barb always did…to be gentle spirited, kind, hospitable and always SMILE. I continue to learn to never, ever take people or life for granted. To hug,laugh and TELL PEOPLE that I love them. So often I find I focus on such silly things…but I’m learning and I will continue to learn…. I keep my resolve to keep taking pictures…today and for years to come I can look back and SEE Barb’s face in so many pictures. And most of all I LEARNED that Barb Inch has left a heart print on my life and I am so very, very grateful that she came my way…..
Rest in Peace, my dear friend…see you later…..
Oh Barb, I’m so sorry for the loss of your friend. I have tears in my eyes even though I didn’t know her. You touched my heart today. Thanks Teresa. It just keeps reminding us how short life can be and how precious it is. LOVE YOU, my dear friend. So so sad but you brought her back to life with your words. Thank you Barb for helping me to put my thoughts of Barb and Mark into words and resolutions to live the days that God gives me even better. We grieve as you do but so thankful for the hope that we share with the Inch’s. Barb showed such grace in her battle. For those of us who shared our chemo treatments together, her smiles, her faith and her hugs will live on forever in my heart. It aches so much today….but pictures of her with that “Barb smile” will help me to smile again. I’ve known Mark for just about my whole life but never had the opportunity to meet his family. You’ve brought Barb to life and I can see that she was the perfect partner for my friend. My heart breaks for his loss and that of his children. I know they rejoice that her pain is gone and she is throwing party after party in heaven now, but the grief is still there. Thank you for introducing me to this amazing woman. I, too, knew the Inch family while they were here at Fort Leavenworth, Kansas. Although I don’t think I knew Barb as well as you did, I do know that she was always a very kind and caring individual. My thoughts and prayers are with the Inch family while they deal with this difficult loss; hopefully many wonderful memories will sustain them as they continue to cope with Barb’s loss. Beautiful words about an inspirational woman. Thank you for sharing your heartfelt tribute. So sad to read this news, so very sad. Met Barb at Fort Leavenworth and have only very fond(and fun) memories! My heart and prayers go out to Barbs family and friends. Again, Barb what a gift you have for writing. I hope at some point in time you share this with Mark and his family. What a joy it will bring them down the road. You made Barb come alive in your writing, even for me who has only known about her from you in the past. What an example she was for those that knew her….and those who did not. Thanks Karen. I actually posted this on Mark’s wall and when we spoke today he was so pleased and especially with the picture…again…the value of taking all those pictures. We never know when we will want to just stare at them for long moments of remembering. I knew Barb at Leavenworth. She was so welcoming, especially to a (relatively) new MP spouse like myself. She was one-of-a-kind and will be sorely missed in our community. What a beautiful tribute you’ve written about your friend. Your words will bring comfort to her family and spread the message of her life, her faith, and her courage. You remind me of how closely knit the Army family is. Lost my brother to cancer in 2004. Will always miss him. Met the Inches at West Point also…they were our neighbors and our children were best buds…She will be greatly missed. I knew Barbara as a Soldier in the Reserves. We were stationed together for a souple of years and then she moved away. I remember seeing her sometime in 2010 back at Leavenworth. This is such a shock. God Bless the family, my thoughts and prayers go out to them. If there is anything I can ever do, please don’t hesistate to ask. Very sad, and incredibly bizarre circumstances. We shared a duplex with Barb and Mark and the kids in 2009 and 2010 at Fort Leavenworth. Both Barb and my wife Chris were in great shape, and ran all the time. In June 2010 we were absolutely shocked when Chris was diagnosed with terminal brain cancer, and Barb was so supportive. A few months later, we were once again shocked when Barb was diagnosed with breast cancer. Chris died two months ago, Barb yesterday. It was a very unlucky duplex, and this is a very tough winter. But they were both wonderful people, and wonderful friends. We are all sad these days, but I have to believe heaven is richer today with these two up there, probably doing more laps around the clouds. God bless Barb, Mark and their kids, and my greatest hope is they find some peace in an otherwise horrible turn of events as they hold onto the memory of their incredible wife and mother. What a wonderful lady Barb was…a kind word for everyone, a mentor to young families, and full of grace and love. She was such an asset to our Ft. Leavenworth community and will be sorely missed by all whose lives she touched. I will keep the Inch family in my prayers–what a difficult road they will travel. Heaven is a richer place because Barb is there…. Very nicely written, indeed. We never met Barb – we only knew Mark as a young high school student as his youth directors. (and had his Dad as a professor in college.) We value our brief re-connection with him through FaceBook recently, and were impacted with his loss, and obviously your loss. Thank you for helping us know Barb a little, even though we never met her. Thank you so much for sharing your experiences with this very wonderful person. Barb Tatley was a sister in my wife’s sorority in college; such a sunny, happy, loving and wise person even then. We are all incredibly blessed to have had Barb touch our lives.